How Important is skin color in the workplace? Before you answer, read this. Diversity Leaders Want A.I. with Both Ethics and Results. Findings Point How to Get There. True Blue Inclusion, a forward looking company working primarily with diversity leaders in Fortune 250 firms, embarked on a research journey born out of a conversation at a global thought leadership forum in London in 2013. The conversation challenged whether or not there was a race issue in Europe. While that question alone would raise eyebrows in many circles, True Blue Inclusion commissioned a study on the impact of not race, but color in the workplace. While it might appear that this question lacks either an insightful or meaningful basis to study, it is quite the contrary. What was largely discovered during the initial stages of the research was that this topic was being widely discussed among academics but had little if any spillover into the corporate community. Equally interesting, while color has long been considered a basis for discrimination, very few examples of color discrimination could be found. What was found eventually became a race, rather than color, cause of action. So, through a considerable literature search and upwards of 50 interviews with corporate leaders and academics, True Blue Inclusion produced its research findings, appropriately titled ‘True Colors: Identity, Labeling & Global Colorism.’ It’s appropriately titled because the intersections that occur between how a person identifies him or herself compared to how the same person is labeled, positively or negatively, by others is deeply rooted in the color of the person’s skin. Treatment, access, fair play, and opportunity all form a very interesting playground for discussion when one looks at the intersections and how they play out. Many years ago as a kid growing up in New York City, I recall engaging in what was at the time a harmless pastime of double-dutch, a jump rope game where two ropes were turned, you jump in the middle and depending on your skill demonstrated fancy footwork like spins. I recall this kid’s game because we usually sang songs as we jumped. My favorite, at the time, was “If you’re white you’re right, if you’re brown stick around, if you’re black get back.” What is old is now new again as we confront similar issues with a more sophisticated and educated inquiry and response. I was a naïve black child who grew up to be a naïve black man in the sophisticated racially marginalized and seemingly integrated city of New York. Through the early part of the Civil Rights Movement I wondered why sitting at a lunch counter was such a big deal, along with being denied access to schools, movie theaters, and the like. I came and went as I pleased to anywhere I wanted to go…or so I believed. We had unknowingly carved out safe places, ignorantly chalking up fights and racial and ethnic name calling as we traversed the city as normal and sometimes fun. I spin this background to explain why I believe we must engage in a conversation that includes race but where race is not the be-all and end-all, because it is not an all-inclusive debate of who is treated fairly or not, who is denied access to education and opportunity or not or potentially who gets hit in the head or shot by police or not. Colorism (discrimination based on skin tone) is alive and well in the US and around the world. One only needs to look at the skin lightening and bleaching creams and their success around the world to see that light or lighter continues to be the standard of beauty, or that darker skinned kids receive harsher punishments than lighter ones for the same infraction, or that it’s likely corporate talent pipelines have a bias or tendency to be disproportionately light skinned. Recently a good friend and colleague updated my song; “Black may be beautiful – and Tan may be grand – but White is the color of the big boss man.” Dare I say, what was old, is now new again. In an interesting, unobtrusive online study, our organization looked at over 2000 photos of Fortune 100 companies representing 17 business sectors. We did a lot of boring things like adjusting for light and shading, but we also determined, as you might suspect, that there was a significant representation of skin color pantones that could be attributed to white but could also include light skinned minorities. This info graphic more accurately portrays the various skin pantones used in the comparison analysis portion of our study. What is shown here is the 86 skin color pantones that correspond with the family of pantone colors associated with the 2000 hi res photos we reviewed. While someone might associate a particular pantone to a race (labeling) our association was to see if there was a corresponding pantone bias (colorism) when compared to the 2000 senior level executives in a corporation. 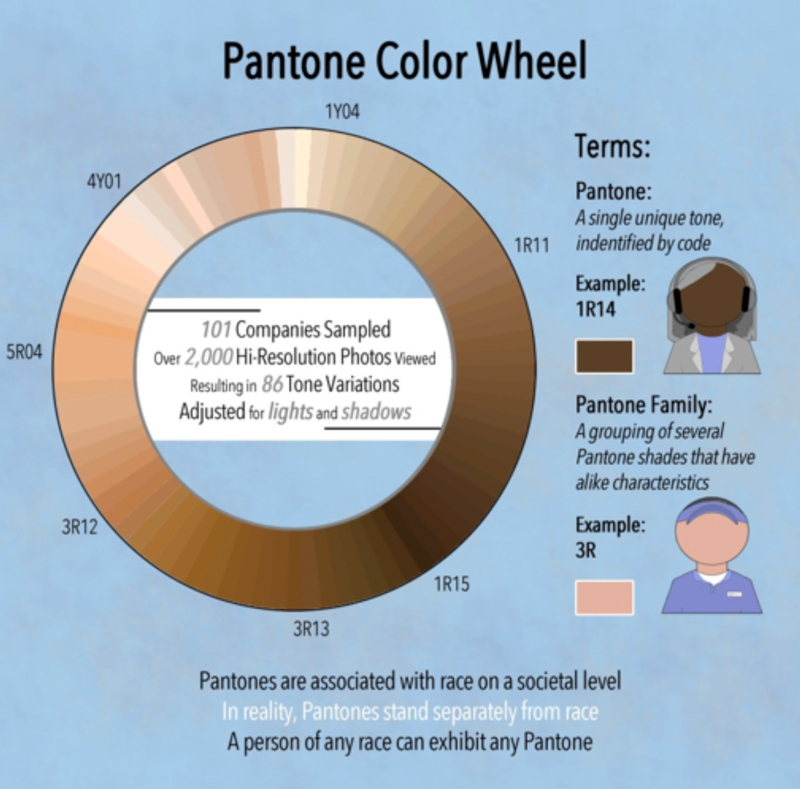 Not surprisingly, the pantones associated with lighter skinned individuals overwhelmingly dominated the study. 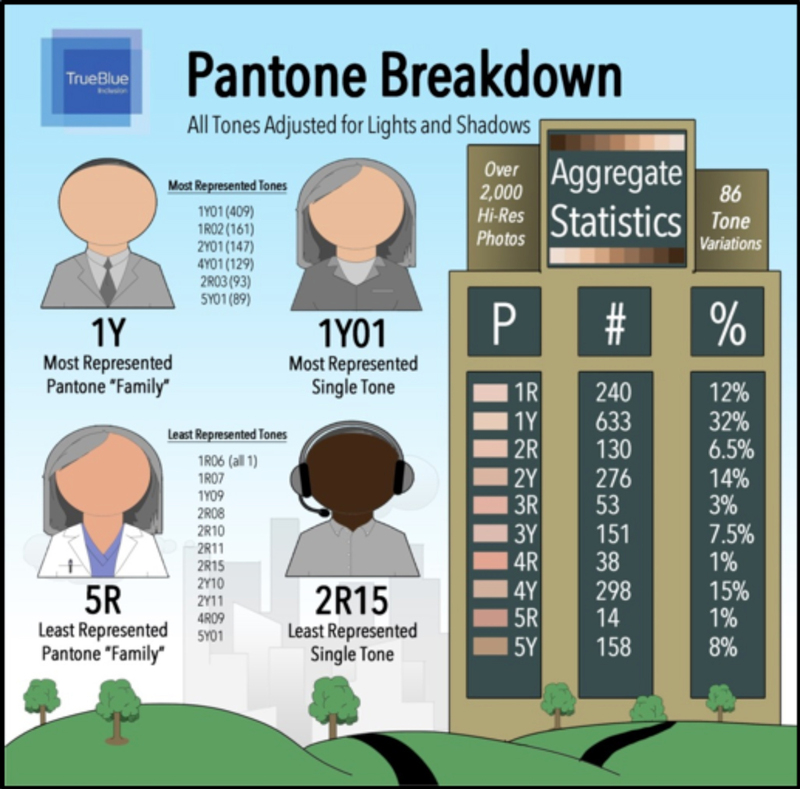 Also not unexpectedly, the pantones that were least represented among executives in the study, shown below, were darker skinned. access to opportunities and corporate talent pipelines? After all, this is a conversation about talent and in some ways race, labels and color. The issue is creeping into the workplace as we look at a recent case, ‘Too Dark to Handle Money’ Etienne v. Spanish Truck & Casino Plaza LLC (5th Cir., 2015), a rare instance in which color discrimination is spotlighted. In this case, a dark complexioned African American waitress was not promoted to supervisor. The majority of supervisors and managers were African American, including the person who was promoted. So “race” was not a factor. However, there was evidence that the general manager made ongoing comments that certain employees were “too black” to be promoted, or “dark skins” should not handle money. A former manager stated that the GM had a practice of deciding job duties based on skin tone. The overtness of these statements and acts are both troubling and hard to believe, but as I think back to my own naïve past I have to wonder how much this is playing out in the real world of work and how much implicit or explicit bias is playing a role in decisions that result in an underutilized talent pipeline. The diversity and inclusion field is complex at its core and most, if not all, of the leaders in the field are looked to for engaging its leadership in uncomfortable conversations regarding talent optimization which leads to business success. Examining your workforce and workforce practices to ensure color inclusiveness is not a solution looking for a problem, but a reality check. The first responsibility of a leader is to define reality. Winning in the war for talent is first and foremost a leadership imperative where skin color cannot be allowed to be a barrier to your success.